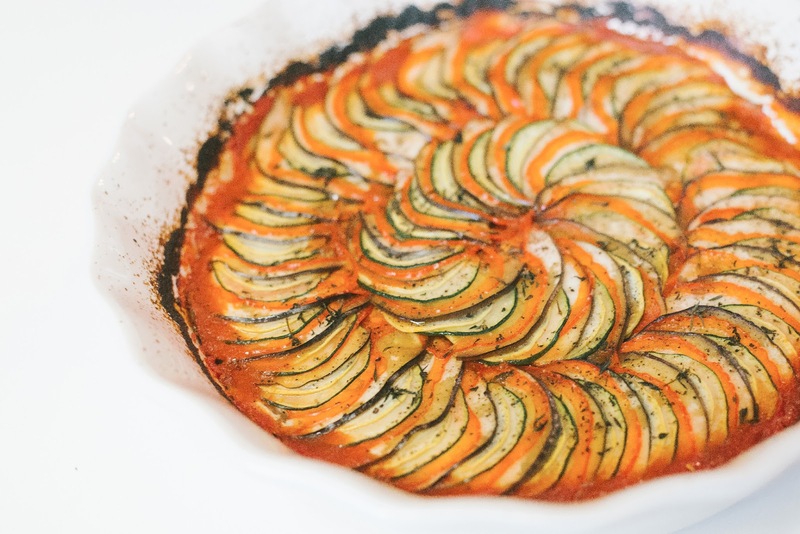 i have to admit, ever since watching ratatouille as a kid, i have been so curious to know what this dish would taste like. i know it is a bunch of veggies, but in the movie, & yes i know it is a cartoon, it just looks so good! so to keep with the french theme of mark's birthday back in february, i made this side dish! 2. using a round baking dish, about 9 inches, pour tomato puree in the bottom of the pan. add onions, garlic & 1 tbsp of olive oil. salt and pepper generously & mix gently to combine. 3. trim the ends off the eggplant, zucchini and yellow squash. trim the ends off of the red pepper & remove the core, leaving the edges intact, like a tube. 4. using a mandoline, or a very sharp knife, cut the veggies into very thin slices, approximately 1/16-inch thick. 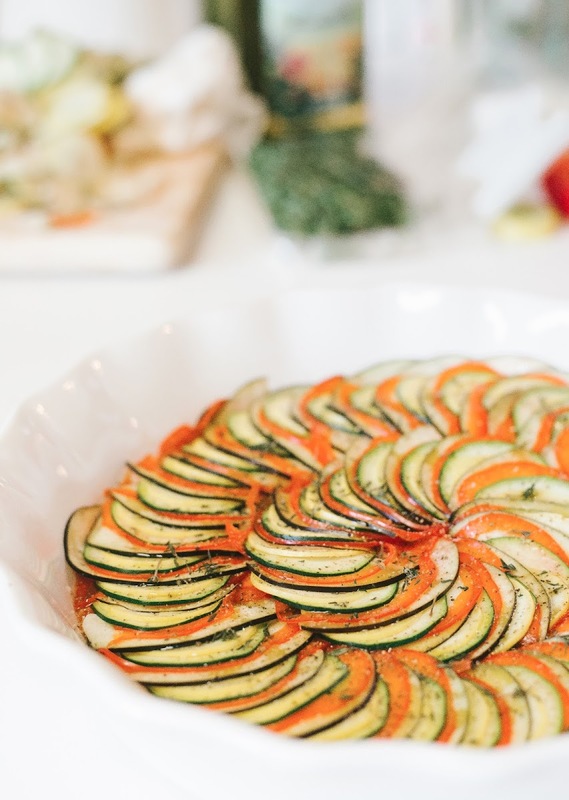 5. on top of the tomato puree, arrange slices of veggies from the outer edge to the inside of the baking dish, overlapping so just a smidgen of each flat surface is visible, alternating vegetables. you may have a handful leftover that do not fit. 6. drizzle remaining tablespoon of olive oil on top of the veggies and season generously with salt and pepper. remove the leaves from the thyme sprigs and roughly chop them. then sprinkle over the veggies. 7. bake for about 45-55 minutes until veggies are cooked but not totally limp. the tomato sauce will be bubbling up around the edges. 8. serve on top of a grain with a dollop of goat cheese or as a side dish with a yummy protein! This looks so yummy! Plus, I love the movie ;) Definitely worth a try!